Is there value to voting? Can voting stop fascism? Police murder… and the murderous logic of this system’s election game. In 2015 The Bob Avakian Institute proudly announced the release of a film of the historic November 2014 Dialogue held on a question of great importance in today’s world between the Revolutionary Christian Cornel West and the Revolutionary Communist Bob Avakian. Contribute to enabling this Dialogue to be seen throughout society. 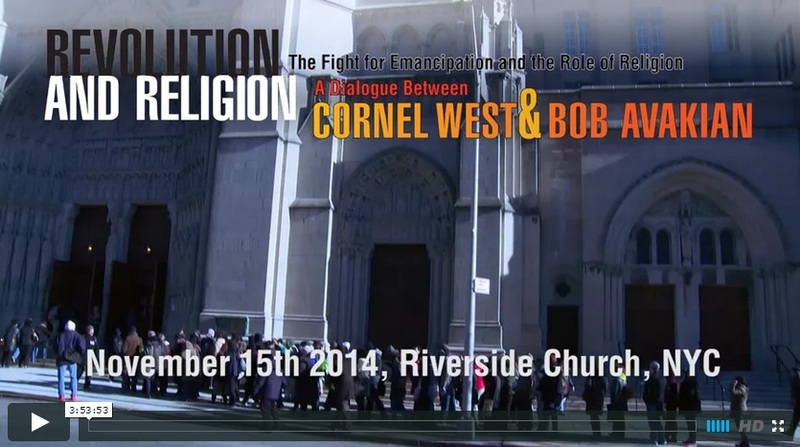 On November 15, 2014, 1900 people witnessed this historic dialogue at Riverside Church in New York City, co-sponosored by The Bob Avakian Institute, in conjunction with Revolution Books, NYC. This Dialogue between Cornel West and Bob Avakian was infused with the fire and passion to bring an end to all forms of oppression. They cut to the bone on the outrages of today’s world and the need for radical change. It was a dialogue of transgression and convergence… a challenge to people to discard the mental traps and allures of this system… a stirring model of struggle and unity… a call to Stand Up and Act. 2 DVD set featuring the full film and chapters. 3 hours, 53 minutes. $10. Bob Avakian is the Chairman of the Revolutionary Communist Party, USA. Bob Avakian (BA) came alive as a revolutionary in the 1960s. Since then he has given his heart and knowledge to serving the cause of revolution and the emancipation of humanity, and has consistently taken responsibility for leading the revolutionary movement – theoretically and practically. He is an innovative and critical thinker who has brought forward a new synthesis of communism. His extensive and wide-ranging body of work includes writings and commentary on revolutionary strategy, philosophy, ethics, science, basketball, music, and religion, including the book Away with All Gods! Unchaining the Mind and Radically Changing the World. For more, go to “Bob Avakian” at revcom.us. Cornel West is widely recognized as one of the most important and provocative public intellectuals of our time. A prolific writer and lecturer, West is Professor of Philosophy and Christian Practice at Union Theological Seminary in New York. A champion for the oppressed, West’s writing, speaking and teaching draw inspiration from and weave together the Christian and Black prophetic traditions, radical democracy and jazz, R&B and hip hop. His book, Race Matters, changed the course of America’s dialogue on race and justice. Cornel West’s latest book, Black Prophetic Fire, has just been published in October 2014. For more, go to cornelwest.com.